This recipe looks long and complicated, but it’s really not! Simply cook the beans (this part is what takes the longest, but you don’t have to do much work). Add some simple fixin's like herbs, veggies, and spices. Form into "burgers." Cook and top with veggies. It takes a few hours, but it’s simple steps and not a whole lot of ingredients needed. You could even take a short cut by using canned white beans rather than soaking and cooking dried beans. In a large bowl, cover the beans with water and allow to soak for at least 4 hours or overnight. Strain the beans and pour into a large Dutch oven or pot. Pour in the stock of choice and water. Bring to a boil, cover, and allow to simmer for an hour and half. Stirring occasionally. Add the seasonings (garlic, onion, oregano, lemon zest, rosemary, salt, and pepper). Stir well to combine, cover again, and continue to simmer for another 2 hours or so (until the beans soften and absorb the liquid). You may need to add more water throughout the process to keep the beans moist until they have become soft. Once the beans are tender, turn off the heat and allow to cool (about 30 minutes to an hour) before preparing the burger patties. To prepare the burgers, mash the beans with a fork or potato masher. Whisk an egg and combine it with the beans. Add in the dill paste and oats. Toss everything to combine well. Allow to set in the fridge for about 30 minutes (meanwhile prepare the salad below). Form the beans into burger-shaped patties by scooping out large handful-shaped or cup-size portions. In a large saute pan, add a teaspoon of olive oil and heat to medium heat. Add 3-4 bean burgers and allow to cook on the first side (about 5 minutes) without touching. Flip when the first side has become golden brown and allow to cook on the other side for another 4-5 minutes. 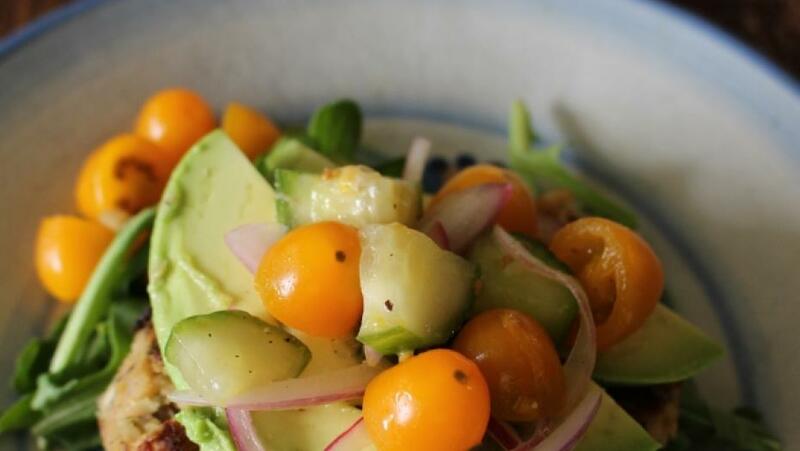 Serve on top of a bed of arugula, top with sliced avocado, and the fresh tomato cucumber Mediterranean salad.